If candy corn and penny rolls aren’t thrilling enough for your yearly Halloween meals, might I suggest the following foods for the more adventurous types out there? Ranging from the deadly to the…less orthodox meal options, I’m sure there’s at least one thing here that might strike your fancy. This one has been described as quite delicious by many of the people who’ve eaten it and ‘survived’. As long as you have a skilled and licensed chef available, that shouldn’t be a problem. Yes, people need licenses to prepare fugu. One wrong cut into the fish, and you risk killing your customers, so this is perfectly understandable. Even when prepared just right, many parts of the fish still have the lingering flavor of the neurotoxin these fish are so famous for, and the flavor may bring with it a slight tingling on the pallette. Live baby octopus. 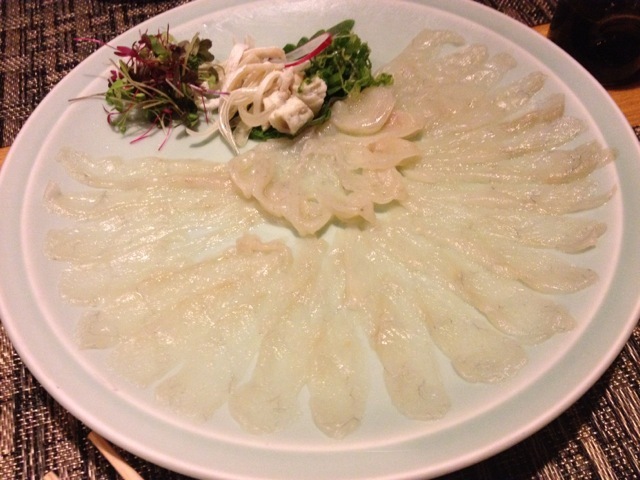 Not quite as easy to eat as your typical fugu, this one tends to struggle…it won’t go down easy. 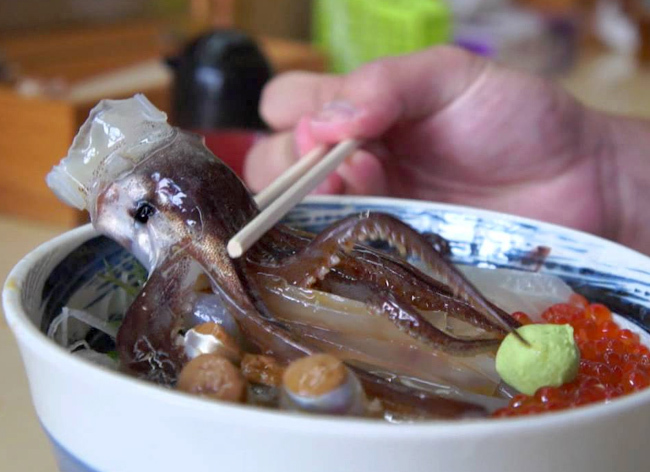 If you don’t want to eat it whole, it can also be served chopped up…still wriggling…I must admit, though I love seafood, I don’t even think I could tackle this one. I’d feel too guilty looking into those cute little Cthulhu eyes. Just remind yourself…some day this thing could become an old one. And if it remembers you as the guy who failed to eat it, there could be untold horrors awaiting you in the future. Much less likely to kill you, yet still not for the faint of heart. Every time I pass these in the Asian market, a little shiver goes down my spine. 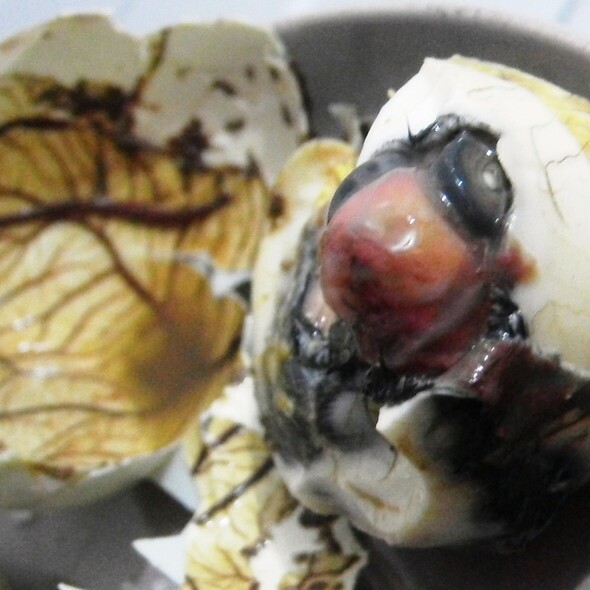 For the uninnitiated, balut is a duck egg. Not too scary at first, but inside is the half-developed embryo of the ill-fated avian. Generally boiled and eaten in the shell, I can’t help but wonder what the cholesterol content must be with all of those tiny bones and feathers soaking stuff up. 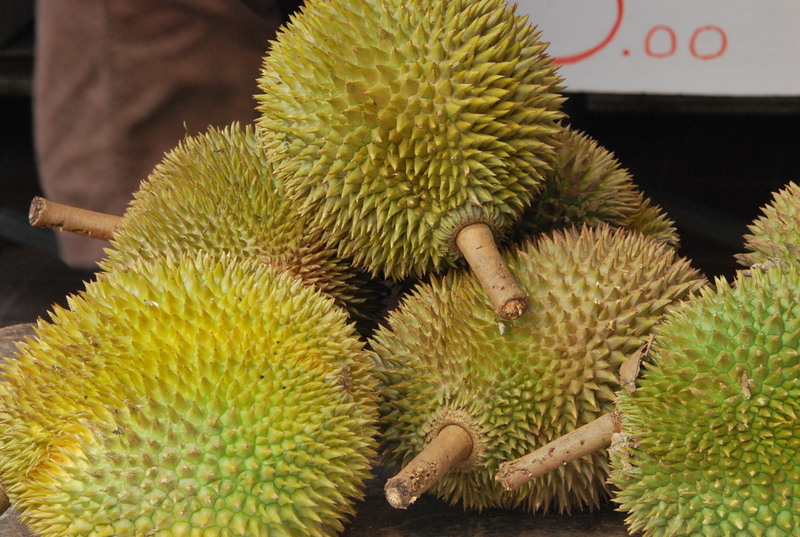 Lots of people can not stand the taste or smell of Durian, which I can completely understand. After a trip to the Asian market recently, my roommate (who is a die-hard and wonder bread white guy) decided to pick up one. He absolutely loves the stuff. When I tried to examine it, this vampiric cantelope (not really a cantelope) decided to take a bite out of me. Later on, when the scent of gasoline permeated the air at home, I was happy to take a bite out of it too. Surprisingly, I actually enjoyed it. There is a bit of a foot-like aftertaste, but otherwise…I’d say it’s not too bad. Then again…I’ve eaten some strange things in my day. Related to the lychee, but not quite as innocent. It’s also the national fruit of Jamaica. One should only eat this at the right time, when the fruit is perfectly ripe. With my experience in harvesting sour apples, I can say it’s not always an easy task unless you know what you’re doing. From what I’ve read, Ackee is buttery and creamy, pairing excellently with salty cod or shellfish. 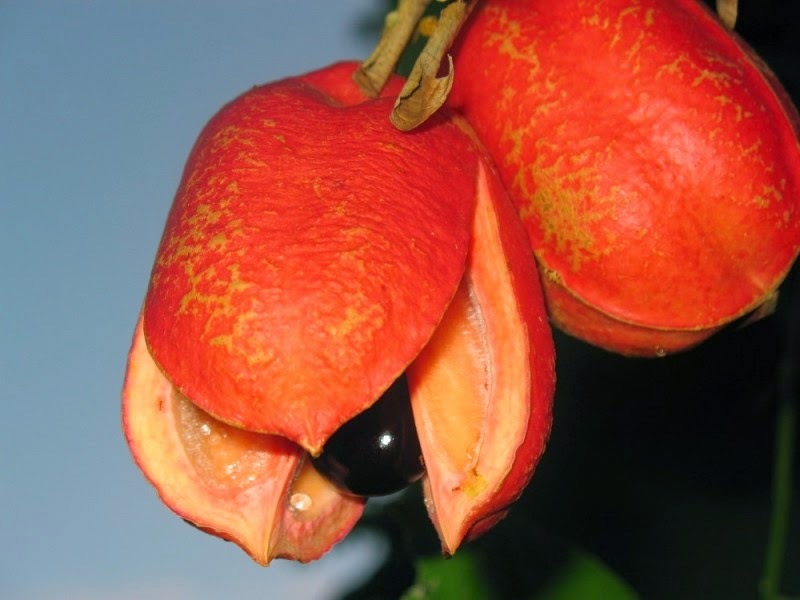 Be warned though, Ackee can be incredibly dangerous if you eat the wrong part. Aka ‘Star fruit’, that funny-looking delight that haunts grocery stores very rarely, and gets snatched up faster than you can blink. For anyone with healthy kidneys, this is just fine. Excellent on it’s own or in a tangy salad. 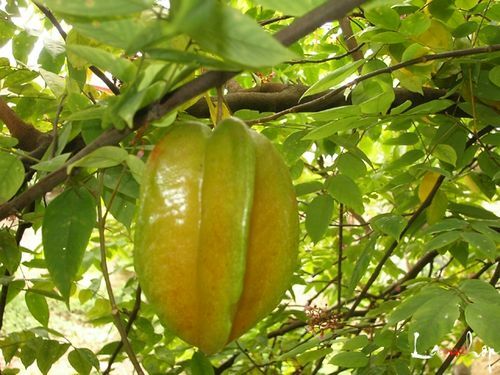 Unfortunately, if you have kidney issues…just 100 ml of juice from the star fruit could kill you. This entry was posted on October 11, 2015 at 10:44 am and is filed under Food with tags ackee, blowfish, blowfish dish, carambola, creepy food, dangerous food, fugu, live octopus, sannakji, scary food, starfruit. You can follow any responses to this entry through the RSS 2.0 feed. You can leave a response, or trackback from your own site. “Casu Marzu begins as Pecorino Sardo (Fiore Sardo), a cheese that’s typically soaked in brine, smoked, and left to ripen in the cheese cellars of central Sardinia. But to produce Casu Marzu, cheese makers set the Pecorino Sardo outside in the open – uncovered – and allow cheese flies (scientifically named Piophila casei) to lay eggs inside of it.